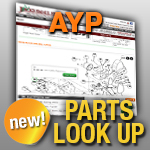 AYP/Electrolux Fittings: Jacks is your Place! We have the Fittings you need, with fast shipping and great prices! For lawn mower parts and accessories, think Jacks! HUSQVARNA : 2042 LS, 2346 XLS, 2754 GLS, CT 130, CTH 150, and other mowers.